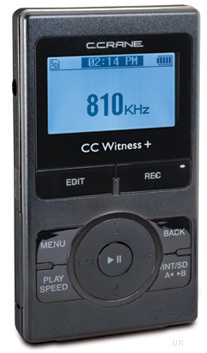 The C. Crane CC Witness Plus is one of the few digital recorder/MP3 players that also has both AM and FM radio onboard. Designed for the radio aficionado, the CC Witness has 2GB of onboard memory and up to 16GB of external memory on an optional SD card. That's 18GB of memory that you can have with you whenever you need it to record your favorite radio programs, your thoughts, lectures and even music. With so much space built into the unit, you'll have plenty of room to store hundreds of hours of recordings, and still have room for more. If you've ever worried about missing your favorite radio show, than the CC Witness Plus might just make your day — since you can preset it to record up to 20 programs in advance. You can even make MP3 recordings of AM/FM radio programs on the fly. You can use the CC Witness to record meetings, memos, language lessons or even that memoir you've been wanting to write, and you can use it as an MP3 player, to play back your favorite songs or audio books. This new Plus version features stereo microphones, CD quality (WAV) recording, and a Mini USB jack. Compatable with Windows 2000, ME, XP, Vista, 7 plus MAC OS10 and above. Weight: 3.6 oz. Size: 2.2" W x 4" H x 0.6" D.
Copyright 2012-2015, Universal Radio, Inc.